Screen-Free Week is about disconnecting from entertainment screens for an entire week. But what if we were to ask children to disconnect for an entire year? 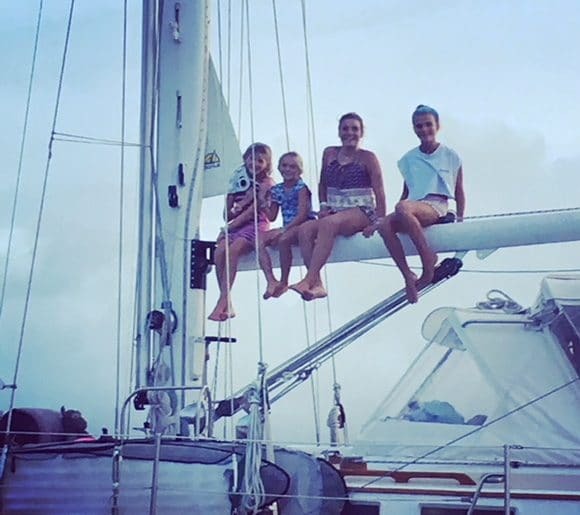 We’ve asked Hadley, Finley, Tilly, and Scotia to share the challenges and benefits of going screen-free for 11 months on the seas, and this is what they told us. Many thanks to their parents, Kelly and Ned, for allowing the girls to share their story with us. On the boat, not using electronics made me so happy because I got to spend more time with my family. I got to go up on deck and get some fresh air. I could play card games. When I was not using iPads, phones, computers or any other electronics, I felt so much better. I was not getting headaches or feeling sick. It made me feel so much nicer because I was spending time with my family and not staring at a screen. I was meeting new friends and having friendship with them. Me and my sister Tilly built forts with cushions in towels and brought our stuffed animals in them. We would pretend to take our stuffed animals up and down the deck. We would play nurse with markers clips and notepads. We would read and not go on any electronics – just read! Upstairs and downstairs, in our beds or out of our beds, just reading tons of the time. When we were not using electronics we were so much better and we talked and communicated more. My advice, Don’t use so many electronics! Can you promise me you won’t use so many electronics? Since we got back home we have a basket that we put our electronics in. If you use to much then it will effect your brain and you will get angry and I know that because it happened to me. What I am trying to say is don’t always spend time using your electronics. You will feel so much better not using them so much. Not having any electronics and living on a boat for a year has made a huge impact on my life in many ways. It has taught me to get outside and see the world and the nature in it. It has taught me to love others and be kind. It has made me happier and healthier. Not having electronics has not only made me happier, but it has made my family happier, because when one person is happy, you can make everyone happy with even just a smile, a laugh, or a hug. Just one kind thing can make a gigantic impact on someone else’s life. Looking at a screen all day can’t do any of this. Looking at a screen all day will just make you angry, tired and miserable. We got to see almost the whole world. We got to see huge rocks and huge leaves, we got to see the tiniest bug. When we discovered new things, it made us so much happier because we had never seen it before and we weren’t looking at any electronics. Nobody gets anywhere when all you do is stare at one thing. To be a scientist you have to look at nature, to be a doctor you have to look at nature, to be a lawyer you have to look at nature, to be the president you have to look at nature. If you want to be successful, you have to take a walk outside, or anywhere, and look at nature. Don’t just stare at a bright screen that sometimes can give you brain damage. I have found that since being back electronics effect my brain in a negative way. The school I am at now we have to use an iPad for and sometimes I get sucked in on it for longer than I need to be. I find that I am extra grumpy and almost angry these days. I have to watch myself and make sure I get out and do things that make my brain happy and have a positive effect. It was not until we got off the boat that I was able to get my first phone for my birthday. I was so excited and for a while I was addicted. So we have started this thing where my mom takes our phones and we have to read 1 or more books a week if we want to keep it…and not until we finish at least one do we we get our phones back. It is quite frustrating but I am pushing through it now and starting to get into some good books. Not having electronics has done a lot for my family and me. I am so proud of all of us, and we are all so much happier. It has kept us in shape and we are getting back into the school groove. I love school and love my new friends. We get ourselves outside whether rain, snow, or shine, maybe even hail. Get off your screens and have some fun in nature! Maybe even take a trip on a boat for a year! When I was on the boat, it was the experience of a lifetime. Our family realized that we don’t need electronic devices to keep us busy. 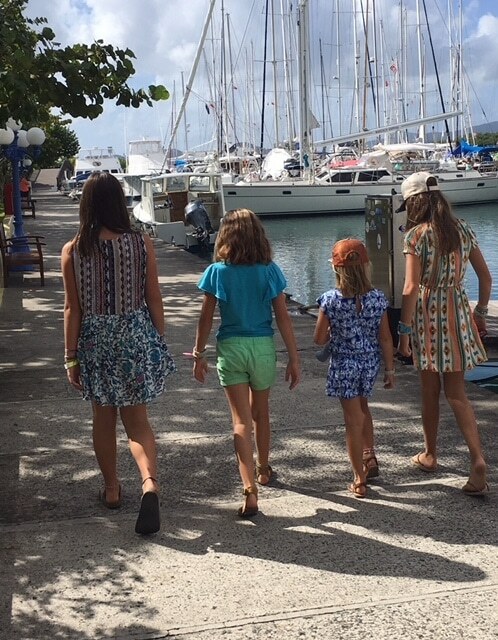 For example, my little sister Scotia and I, would take walks up and down the boat, pretending to walk our stuffed animal dogs. Whenever our parents were out buying food for the family and seeing if the island was safe, my sisters and I would play cards and dance to music until our parents would get back. When we were underway, we would all build forts out of cushions and pillows, and camp out in them the following night. Our parents taught us that we didn’t need electronics to have fun. 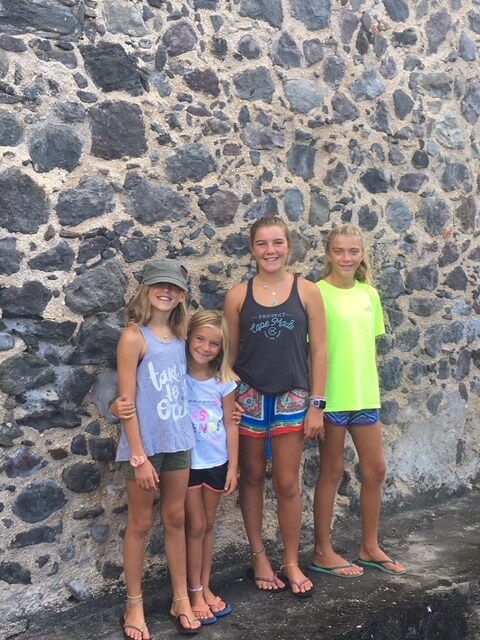 We would spend most of our time in the water, playing games and snorkeling, seeing new fish and hanging out with dolphins and sharks. We would play games and interact with each other more than we ever had before. We would pretend we worked at shoe stores, real estate agencies, and clothing stores. We would name everything H.F.T.S. After our names, Hadley, Finley, Tilly, and Scotia. If we start using using electronics too much, it could effect our brains in a negative way. We have noticed a change from when we didn’t use electronics to when we have. Everything is better without electronics. Since we have been back from our boat trip, we have been using our electronics too much, which is putting us in bad moods. Having no electronics has made a huge impact on my life in the past year. Starting with having more family time. Also more time to focus on school work for home schooling. On the boat compared to now a lot of things have changed. On the boat we were always together and happy without electronics. There was never a question “Why don’t I have an IPhone?” Or “Why can’t I get phones or iPad or any sort of electronic?” We just knew that we didn’t need them and/or we didn’t want them because that was the rule. We were on the boat for family time, not to worry about what was happening on Snapchat or seeing pictures of where people were on Instagram. It was just talking with my sister and my mom and dad. Asking for help with my homework from my older sister or parents instead of asking Siri. Now that we are back from the boat trip and back to real school there is so much more going on. My family and I never get to see each other anymore. Everyone is always going to different places at different times. And when there are family members home we are doing homework and figuring out the answers ourselves. We are able to do this because on the boat we asked for an example instead of just asking Siri for the answer. Everyday for homework whether it is in math, English, or any other subjects we know to try it ourselves and use what we learned from people to solve these problems. On the boat we were forced to learn how to talk to people, to socialize instead of texting and making plans that we were going to play video games later or something like that. When we were on the boat meeting new people and seeing new places there never really was any time to think about electronics or worry that your phone was going to die and not be able to do your Snapchat streaks because you couldn’t charge your phone or other electronic unless it was a emergency. Sure, I thought about getting a phone but I never asked because I just knew that I didn’t need one because there really was no point. We were out in the middle of the ocean most of the time and there was no WiFi to do anything. So why spend money on something that’s not that important and wouldn’t be useful at most times. When we got back from the boat there was a rule. We had a basket when you walked in the door. That’s where you put your phone when you come in. Of course if you needed something it was always there for you to grab and use. But you didn’t need to be walking around with it all the time. When my sister got her first phone when we got back for her thirteenth birthday she was hardly ever on it. It was always in the basket along with everybody’s who was over our house phone too. Pretty soon there wasn’t even a question when you walked in the door to our house everyone knew that your phone went on the basket unless you needed it for some reason. This rule still stands in our house. This is why and how not having electronics has impacted my life so hugely and this will be a life lesson for my sisters and I, hopefully for a lifetime.